Answer: I believe what you are describing is the “flower” of the Aglaonema. The Aglaonema also know as the “chinese evergeen” comes from the Aroid family. This plant family gives us many house plant varieties including the Spathiphyllum, Pothos Philodendron, Anthurium, the ZZ plant and of course the Aglaonema species, but there are others. Most people are familiar with the Anthurium flower which has become a symbol for the Hawaiian Islands, or the ‘Peace Lily” (Spathiphyllum) one of the most popular houseplants grown around the world for its pure white "hoods" stands above its dark green foliage during the spring. However, most people are not familiar with the Philodendron or Aglaonema flower. Generally they are not flashy and get lost among the foliage. The Aglaonema can be a very prolific bloomer, and does at times confuse people. The "flower" is really an inflorescence (a group of flowers on a stem) and is often mistaken for a distorted leaf. This can lead to other mistakes in caring for this durable low light house plant by trying to "fix" the problem. The flowers look very similar to a Spathiphyllum except for the fact they usually carry a "green hood" and a rather calcified looking spath coming out of it. The "flower" will typically be found below the foliage but can be found easily if you look. 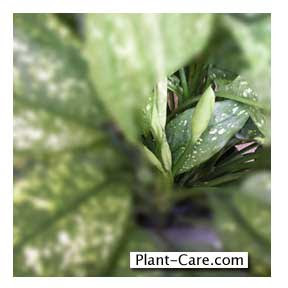 Chinese Evergreen Flower Removal – Yes or No? The question asked most often on this subject is flower removal – should you remove the flower? And… does it hurt the plant? My recommendation is YES – remove the flowers. This goes for any variety of Aglaonema – from the species commutatum, Calypso to Silver Queen, Silver Bay or large BJ Freeman, The flowers serve no benefit – to the plant or to look at. From my experience I’ve noticed an adverse effect from leaving the flower on the plant. Aglaonemas can bloom pretty heavy even if they are “blooms” are insignificant this flower production consumes a lot of energy. The heavy blooming pulls nutrients or energy from the plant. The net result – again from my experience – produces new leaves that are smaller, sometimes distorted and lacking in color appearing pale. To prevent this potential problem, remove or cut off the flowers as they emerge. Just make sure that you remove the flower and not the leaf!!! Aglaonemas are great indoor plants which hold up very well in low light and don't require lots of water. New hybrids like "Silver Bay”, “Silverado”, “Jewel of India” can "Calypso” introduced over the last few years are the “new breed” of Chinese Evergreens slowly making their way into the marketplace. These new varieties continue to make the Aglaonema one of the BEST house plants for indoor use.